This Giraffe is the fourth Amigurumi project in the series created by craft designer for Soft Dolls and Animals. It appears in the November 2011 issue. Perhaps you know someone who adores Giraffes like I do. This would make a great holiday gift. What is Amigurumi? How is it done? And what are its hallmarks? Amigurumi is the Japanese art of knitting or crocheting small animals and anthropomorphic creatures. The literal translation is knitted stuffed toy. The word comes from a combination of Japanese words ami, meaning crocheted or knitted and nuigurumi, meaning stuffed doll. 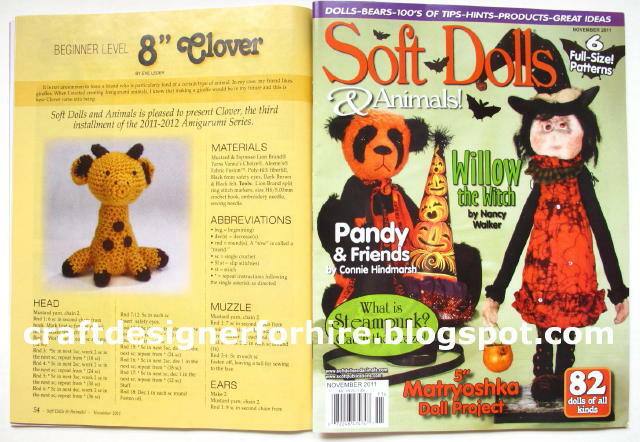 For this series of articles, the stuffed dolls were crocheted out of yarn using the single crochet stitch. The rounds are never joined, instead being worked in a spiral. To help retain the stuffing, the crochet hook should be slightly smaller than what is normally used with a specific weight yarn. Amigurumi are made up of parts that are crocheted, stuffed, and sewn together. The typical artistic style of Amigurumi is an over-sized round head, a cylindrical body, arms and legs, ears, tail (if needed) and embellishments. Felt is often used to embellish or to create the ears, face, or nose. Personally, I would also add the trait of being extremely cute.